Pantry with a Purpose: How to stock your pantry with simple ingredients for making easy, delicious and economical homemade salad dressing recipes. Almost, not quite, but any day now, it will be salad season! Tender spring greens are soon to appear. The weather's turning warm and so we make our annual return to lighter, fresher and "greener" food. So here's my challenge to readers of A Veggie Venture and to salad lovers from all over: Never Buy Salad Dressing Again. Let's make it a hashtag! #NeverBuySaladDressingAgain! I'm here to help. Cookbooks and cooking magazines often suggest ingredients for a well-stocked pantry. But how many of us fill our pantries, then forget to empty them?! And we shouldn't. That's because "cooking from the pantry" is the best way to save money on groceries – at the same time avoiding the calories, additives, waste and inconvenience of carry-out, drive-through and frozen food. So let's stock our pantries with purpose – for now, just for salad dressings. And then – this is the best part – we can learn to love the deliciousness of simple homemade salad dressings, some of us for the first time, some of us all over again. With any luck, you'll challenge yourself to make a salad every single day, for a week, for a month, for the summer, but every day. Let's get started. Are you a make-it-on-the-fly salad dressing maker? Or one who wants to make a "batch" of salad dressing and then use it for a week? Different recipes will appeal to these two camps so it pays to know. Don't worry, both are good and many salad-makers (me included) do both. "Dress a Salad" Here, we make a dressing for an individual salad, whisking and tasting and adapting the dressing's ingredients for particular greens, for particular add-ons. Quantities can be adjusted to make a salad serving one or a large salad for the table. "Dress" a salad with a vinaigrette [vihn-uh-GREHT], a classic oil and vinegar combination with a 3:1 mix of oil:vinegar. To my taste, this is too rich so I reverse the proportions. Learn the proportion you and your family likes, it'll work again and again. "Dress Like An Italian"! This is what I do most nights, so simple. Splash a little good vinegar (plus a sprinkle of good salt and a little pepper) over salad greens and toss well to lightly coat the leaves. Now drizzle a little olive oil over top and toss the greens again. Always remember, vinegar first, oil second, it helps the oil adhere to the greens. For anyone who's not "dressed a salad" before, my photo tutorial for how to make a simple vinaigrette will be helpful. "Make Salad Dressing" Here, we "make salad dressing", usually a bigger batch that will last a few days or even a week or more. Quantities can be adjusted here, too, for smaller volumes. My favorite recipes are below, I make at least one of these every single week. Just a few pantry items. These are the only ingredients needed for beginners but also the ingredients used by experienced salad makers again and again. Olive Oil Preferably of high quality but perfectly good salad dressings are made with inexpensive olive oil too. If you do invest in a bottle of good olive oil for salad dressings, watch for bottles with dark glass and labels that read "extra-virgin" and "first cold press". It's used in small amounts so it's just fine to buy a small bottle to minimize the up-front expense. Once home, do a taste test. Dip your finger in, does it taste good? smooth? lack harshness? Keep a bottle of good olive oil separate from the cooking oils, we don't want to waste the good stuff! Store it in a cool dark spot, behind a cupboard door, for example, rather than out in the light or near a stove's heat source. Vinegar Plain white vinegar or apple cider vinegar will do but may require more doctoring. If you buy just one vinegar for salad dressing, buy unseasoned rice wine vinegar which is far less harsh and is quite inexpensive. Salt Sea salt or kosher salt, preferably. If need be, table salt will do just fine. Mustard Anything other than yellow mustard of hot-dog fame. Start with Dijon mustard, a classic. Add one or two of these extra pantry items at a time. Keep one or two of the fresh items on hand at a time. Other Vinegars Basics include red wine vinegar, white wine vinegar, sherry vinegar (my personal favorite) and champagne vinegar. When you open a bottle, taste the vinegar – it will be sharp, yes, but do you like how it tastes? If so, it'll make a great salad dressing. Variety of Oils Options include walnut oil, avocado oil, pumpkin seed oil, grapeseed oil and more. These tend to be expensive and have short shelf lives so buy in small volume and use quickly. Dried Herbs Especially useful for make-ahead dressings. Fresh Garlic A clove or two of garlic does wonders for salad dressing. Dairy Products Low-fat buttermilk, cream and milk are common ingredients in creamy salad dressings. Fresh Lemons Can be used as the "acid" in a salad dressing, replacing the vinegar. Fresh Herbs Salad dressing is the #1 reason to plant a few herbs in pots on the patio or balcony. Good choices are chive, French tarragon, basil, thyme and oregano. But otherwise, buy one packet at a time from the supermarket to experiment with what you like. No special tools required! You have all you need, right now! Salad Bowl I love my low, wide wooden walnut salad bowl that somehow manages to feed from one to eight. But any bowl will do, just keep it handy. Think about "dedicating" that bowl for salad, that way it'll never be in the dishwasher, etc., whenever a salad attack arrives. Knife & Cutting Board For quickly chopping garlic and fresh herbs. Fork This is all that's needed to "whisk" the dressing. Small Food Processor For dressings that need real mixing, the food processor attachment of an immersion blender or an actual mini food processor work great. Some dressings become airy and ethereal when "emulsified" – that's the term for combining two ingredients that don't necessarily want to be combined (think oil and water), usually done by slowly adding the oil while vigorously mixing the rest, that's best done in a large food processor or blender with an open top. Glass bottles After emptying any salad dressing bottles already on hand (what, down the drain? who thinks I'd suggest such?!) save them for storing make-ahead dressings. They're not as pretty but for convenience, there's no beating squeeze bottles. READER RECIPES Does your family have a "house dressing"? Restaurants do, why not families?! If you're willing to share a favorite salad dressing recipe, please, I'd love a quick e-mail via recipes@kitchen-parade.com e-mail! Who's Up for The Challenge? Never Buy Salad Dressing Again! Ha! That's not a reaction I'd anticipated, Melissa. 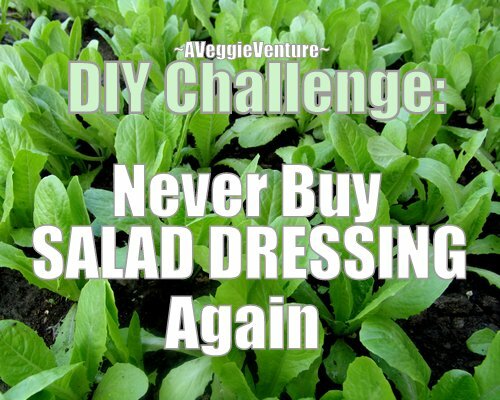 But I might turn the table to say, you're already not buying salad dressing, so you've already taken the challenge! You have impecable timing! I recently ordered AeroGarden's Herb 'n Serve dressing maker to use with my herb garden. Thanks for all the lovely tips and recipe ideas! Putting out salad dressings at night is no better than putting out boxes of breakfast cereal in the morning. I must do this, I must. I accept the challenge. I'm already there, but I'm lazier than you. Not sure when I started,but maybe my approach for everyday simple green salads will work for other lazy cooks: Sprinkle salad with a little balsamic vinegar, a little olive oil (I tend to go about 50-50), a little salt and a grind or two of pepper. Works for me! oh, I always make salad dressing my self I can't stand the bottled stuff. I find it interesting, though that you always say not to use much oil when making salad dressing. so do you rely expect us to compensate with that much vinegar? when ever I make salad dressing for my family with more than a tablespoon they always complain. Alanna, thanks for a great salad dressing tutorial. Lately I find that I make salad dressing only for others; for me, it's a drizzle of the best balsamic vinegar I can afford, nothing more. Good balsamic is sweet, and I'm finding that it goes on almost every type of salad. So I've taken the challenge, too! What a wonderful idea Alanna! I'm embarrassed to say that I have *never* made my own salad dressing - and I'm 57 yrs. old! This is so simple to do, I'm definitely going to do it. Thanks so much Alanna! Dawn ~ Good for you! I hope you'll report how it works for you, whether it's worth the investment. Joanna ~ Caesar is easy! I added my own Caesar dressing to the lists above, too. Anonymous ~ What an apt comparison, thank you. Go for it! Janet ~ that's a simple combination for sure, I love it, thank you for sharing the idea. Anonymous ~ I don't "expect" you to use that much vinegar, I just plant the seed of an idea that it's possible. :-) Your own taste should dictate, as with all things cooking. A couple of thoughts however -- I'm lucky to use good vinegar (and oils, too) from O Olive Oil, they're so delicate, it might make a difference. The other reason is that I nearly always add fresh herbs, fresh ginger, a good mustard, so the 'vinegar' is less apparent. That said, my salad dressings are sharper than is typical -- especially compared to commercial products -- people do tend to notice and remark. I'm soo glad you're already making dressing, it's nice to hear that I'm not the only one in this camp. Meg ~ Excellent time of year, yes! Sally ~ You've got time, m'dear, start today, okay?!! Yes! I had to give up nearly all commercial dressings because of food allergies, and the homemade ones are just so, so much better. And they're actually really easy! Great post, Alanna. Thank you for the link love dear!! I LOVE LOVE LOVE that cucumber dill salad dressing!! Makes me want to go buy some cucumbers right now! I will take you up on your challenge!! I'd love to try some new recipes!! I'm coming late to the party with my comment, but -- I have to say, this is a post that is dear to my heart. I grew up in a home where my working mother always made salad dressing (and many other things) from scratch. I actually didn't know that salad dressing came in a bottle until I went to school and friend's houses and encountered the noxious stuff there. I've been experimenting in raw salad dressings as of late and the results have convinced me to "never buy a salad dressing again" as you say. Thanks for your helpful suggestions and recipes. What a wonderful blog this is! Peace/health/radiance. I stopped buying salad dressings several years ago. I've played around with various recipes, but this one has become my "go-to" recipe since I found it this spring. I use different vinegars or citrus juices, sometimes add dijon or soy sauce (or both). My "part" size is usually a tablespoon and when I use the dijon or mustard it's usually a teaspoon or a little less. One of my favorites uses lemon. Yummy! I almost never buy dressing, except for one particular kind my son likes,and then only "on sale". You have given me hope that I can make something similar at home, and it will be better. An even better idea, get my son to come up with the recipe himself!! What a great idea, NEVER BUY SALAD DRESSING AGAIN. I've been making my own dressings and raw dressings for a few years (though I admit I always gravitate toward the 'sprinkle a bit of oil and vinegar' kind : ) but this has given more insight and inspired me with some fresh ideas, especially as far as stocking the pantry with some new oils and vinegars. Thanks! i don't recall where I found this recipe but I love it! BLEND TOGETHER WELL. MAY BE USED AS A BASE FOR BLUE CHEESE DRESSING (FORGET THE LOW-FAT PART! ), PASTA SALAD, COLE SLAW DRESSING OR DIP. P.S. I ALWAYS USE MORE GARLIC THAN A RECIPE CALLS FOR. Anonymous ~ Tofu, really? Brilliant! Thanks for sharing the recipe!